Tayuya (多由也, Tayuya) was a kunoichi of Otogakure and the only female member of the Sound Four. Tayuya was overbearing and foul-mouthed towards most people, especially Jirōbō, calling him "fatty", as he criticised her over it. She didn't think much of Shikamaru Nara as a leader, but as a weak, useless rat, who ran away when she used her Doki to attack him. 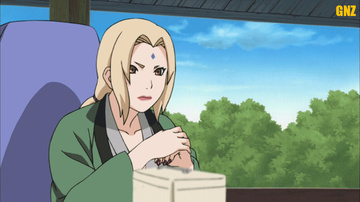 Like several of the Sound Four, Tayuya had her own perception of morality as she criticised Shikamaru for sacrificing members of his team to bring back one person who left with them voluntarily. Orochimaru commented that Tayuya has a "doesn't-want-to-lose" mentality that can slow down the team. Like the rest of the Sound Five, Tayuya constantly referred her enemies as "trash". Tayuya's most distinctive feature was her long, untamed, pink hair (depicted as red in the anime). She also wore a black hat with bandaged sides which was shredded when Tayuya reached her second state. She wore a tan tunic, much like the other members of Sound Four, with black shorts and standard black shinobi sandals. In her second state her skin turns brown and her eyes turn yellow. Her hair grows longer and turns pink in the anime. She also grows a set of horns.